There are days when I have grand plans about what I’m going to make for dinner. Usually in the morning or the night before, I come up with an idea and spend some time thinking about how good it will be. Then I go about my day, cleaning up, trying to keep the plants in my raised beds alive, running to the store, pickling things, and everything else that comes along with being a homeowner and mom. Dinnertime creeps up, and all too frequently I have exhausted myself already, and the thought of heading back into the kitchen just makes me slump farther into the sofa cushions. After a little back-and-forth with my husband about what we will be having after all, I heave myself up and start pulling things from the fridge. While I’ve been slowly teaching my husband to throw together a dinner from the contents of our fridge, it’s still easier to do things myself than dictate a recipe that is living in my head instead of in a book. Pasta is one of my husband’s favorite foods, and lasagna is high up there on his lists of requests. I like lasagna too, but I often feel like it is too heavy, especially in the summertime. Staring at a drawerful of yellow squash and remembering the homemade ricotta in the freezer easily led to this pasta-free version that is perfect for summer. The squash stands in for noodles, creating a veggie-rich main meal that won’t weigh you down at the end of the day. Trim ends off squash, and slice each lengthwise into about 4 pieces, depending on thickness. Salt both sides and let squash sit in a colander set over a sink or bowl for 10 minutes. Mix together ricotta, egg, 1/2 teaspoon salt, pepper, and basil. Taste and adjust seasoning, if needed. Rinse salt off squash and pat dry. Spread 1/3 cup pasta sauce on the bottom of an 8x8 baking dish. Arrange one layer of squash on top, covering as much of the sauce as possible. Spread on half the ricotta, then sprinkle on 3/4 cup mozzarella. Top with 1/2 cup pasta sauce. Repeat layers. Add a final squash layer and spread on remaining sauce. Slice the tomato into approximately six thick slices and arrange on top. Sprinkle on any remaining mozzarella. Bake at 350 degrees for 35-45 minutes, until cheese is browned and sauce is bubbly. Let cool at least 10 minutes before serving. 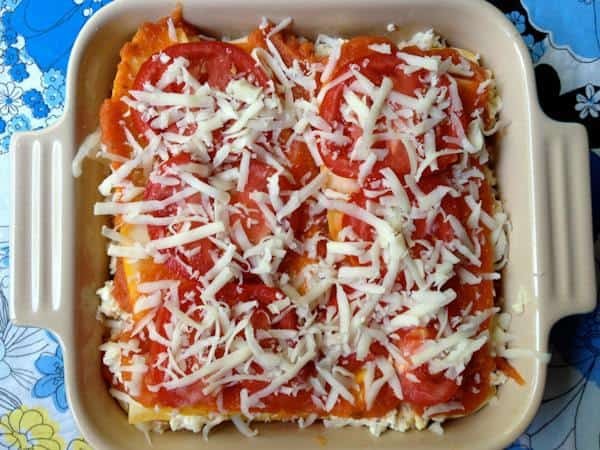 Love this idea of a veggie lasagna! I have all these things on hand at all times in the garden/fridge. Brilliant! I love the flavor combinations of squash, tomatoes, and fresh herbs. I did try this with zucchini once, but used the huge as an arm zucchini I’d let get away from me in the garden and the results were less than stellar. (hard seeds! woody flesh! what was i thinking!?!) You’ve inspired me to give at another (better) go. Sounds delicious! I have also made homemade ricotta, but have been leery of freezing it…Have you had any problems with the consistency changing? @Cindy I didn’t have any issue with the moisture levels once I thawed it. It was a little crumbly at first but after letting it warm up and giving it a good stir it was back to its original texture. I so know how you feel. I swear I feel like that all the time lately. Ooh! Love new uses like this for using up a large-ish amount summer squash… and gf lasagna noodles are such a pain. Win win! Thanks for this. right, i totally think of lasagna as a winter dish. i basically only make it during the holiday season, so this is a cool idea, plus with it being gluten-free and all. Hi, Megan! I was led to your blog while looking for fellow foodies in Austin. Your blog is lovely, and I love your style of writing! So easy and entertaining to read. I’ve also been trying to teach my husband to just put together something on his own, but I end up taking over. His creations…well, they need help! I love this recipe! Perfect for our brutal summer months. Thank you!